Have you ever sat down and really thought about the amount of money you pay in taxes versus the direct benefits you receive from the government? 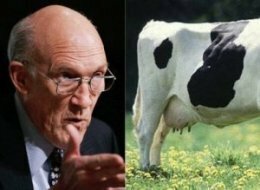 Alan Simpson's rather salty but descriptive comment about Social Security could be politely amended to read: 'The US federal government has 310 million teats on it to milk!'. Depending on how many programs a person derives benefits from or tax preferences he or she uses, the number could be 1 billion for all we know. Do this little exercise right now. Add up all the taxes you pay on one side of the ledger on a piece of paper or Excel spreadsheet. And then add up all the taxes that you saved from any tax deductions you use each year on your tax form and grants you received from the federal government in any form and put them in the other column. We think the nation would be surprised at how many people wind up with exactly the same dollar amount in each column. We basically have a tax system where we tax many people roughly the same amount they get in benefits, subsidies or tax exemptions/deductions. So why not just let them keep their own money in the first place? Let’s take a look at just one obvious glaring example: mortgage interest deductions. Let’s say a family with $120,000 annual income buys a home for $300,000. Right off the bat, this family can expect to incur close to $20,000 in annual interest payments on servicing that mortgage at about $1800/month in interest. This means that this family will be able to deduct that $20,000 in interest payments off of their taxes thereby saving them approximately $7500 per year in taxes not paid to the federal government that otherwise would be paid absent the mortgage interest deduction. On the other hand, this same family can be expected to send to Washington about between $7500 and $10,000 in combined income and payroll taxes. So, in effect, in the ultimate of a circular argument: The United States tax code basically takes $7500 from this family in order to be able to allow this same family the ability to get $20,000 in mortgage deductions (which is a subsidy no matter how you slice and dice it) that saves the same family $7500 in additional taxes. Doesn’t that strike you as a bit weird? Why not just change the tax code so that the same taxpayer doesn’t wind up paying for his or her own subsidy? That is why the consumption tax is so attractive as a replacement for the entire payroll and income tax system. There would be no deductions, no tax subsidies, no exemptions. People would pay taxes only on what they purchase. The more they purchase, or the higher dollar amount of the purchases they make, the more they will be sending to Uncle Sam to help fund the general services of defense, transportation and other necessary services that benefit the entire nation as a whole. Let’s look at another more tangible example: government subsidies for mohair growers. Congress allocated $20 million to farmers of mohair in the U.S. in the year 2000. There are approximately 2000 mohair farmers, mostly in Texas. That is about a $10,000 per farmer direct subsidy payment from the taxpayers to the mohair farmer to continue growing mohair that is no longer used by the US military to make uniforms as it did in WWII. You have to believe that these farmers must be paying at least $10,000 to the federal government each year in income taxes, assuming they make a profit raising and sheering these sheep. Regardless of whether they make a profit or not, they must take a salary out along the way, don’t they? They must be paying taxes of some sort so we are guessing it is at least $10,000 per year. So again, here’s a case where a mohair farmer gets $10,000 from the government to grow mohair on their Angora sheep only to turn around and send the same amount, $10,000, back to the government every year. What is the common sense in that? There are hundreds of thousands of special subsidy line-items in the federal budget, otherwise known as 'single shot, targeted payments for a group of constituents represented by a powerful chairman of a congressional committee'. 'Pork Barrel Projects' for short. There are hundreds of thousands of special tax rules for 'exemptions' (from what? paying their full rate of tax as passed by law) and 'deductions' (to lower the taxes paid by a certain group of constituents because their lobby is more powerful than the ones who don't get the exemption). Why not make the tax code very simple and get rid of it all? It is complicated; corrupt; inefficient and not suited to the real-world of 21st century Planet Earth. Rich people can afford to game the system, legally of course, and lower-income people can not. Companies such as GE basically have learned to game the system to the point where they pay zero income taxes but get enjoy the benefits of public subsidies ranging from green technology grants to export assistance far in excess of what they ever pay in taxes anymore. It is time to change it. Completely. With a consumption tax of 18% on everything we buy. In lieu of the current crazy tax code. It is just plain 'weird'. Who Would You Rather Have A Beer With?